Be sure to celebrate your Mom, Grandma, Auntie or whoever that female is that’s helped you grow, learn, who changed your diapers, fixed your skinned knees or broken bones. Tell her thank you in whatever way is best for her. Would she appreciate a home cooked dinner; a night at the theater; some yard work done; or–my favorite–a facial!  You can purchase a gift certificate at the shop or online. However you tell your Mom “Thank you and I Love You!” I’m sure she will appreciate it. Summer is here, or at least it is trying to get here and with it comes the heat and the sun! So be sure to protect yourself and your loved ones with one of our fabulous sunscreens. We have several different options for applications and price points. Be sure to book your appointment this month for your yearly skin cancer check! Tried and True a great mineral makeup line. I use one of our Primers (Skin Brightener, Skin Bronzer or SPF30 Primer) and our SPF30 or SPF50 powders, and SPF35 Lip Shines every day. Incorporates a Farm to Face® sourcing philosophy, using the freshest and most natural ingredients whenever possible. Their organic formulas contain over 70% certified organic ingredients. They use Plant Protection®, which allows them to achieve clinically tested, broad spectrum and antioxidant-rich protection while using fewer traditional actives. They produce limited quantity batches in San Diego so they are able to reformulate often, taking advantage of new developments in sun science. 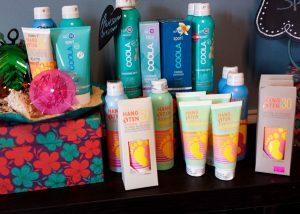 Raspberry Moon carries Coola SPF30 and SPF50 Sprays, SPF50 Sport Lotion and a travel kit with SPF30 Spray, Lip Balm, SPF30 Face, and Radical Recovery Lotion just in case you need it! Also coming this month is their new colored SPF30 Lip Tint. All formulas contain approximately 10 organic ingredients and a signature beach themed all-natural non-synthetic scent, while remaining free from Oxybenzone, Parabens, and Retinyl Palmitate. All Hang Ten Sunscreens provide high performance, non-greasy water resistance formulas testing out at the maximum FDA allowed claim of 80 minutes water resistance. High Performance Natural Sunscreen for all generations! Raspberry Moon carries SPF30 and SPF50 Mineral Sunscreen Lotions, SPF30 and SPF 50 Classic Spray and SPF50 Kids Mineral Lotion and SPF50 Classic Kids Spray (banana scent). Read more about the founder of Coola and HangTen and his philosophy in this Real Simple article. To help you have the best protection this summer, all sunscreen items are 25% off through the month of May! The networking group that I’m a part of has some really neat topics coming up. Like the WSBG Facebook page for all the latest info! We generally meet the second Wednesday of each month, but we will be taking a summer break and not be meeting in June and July. Meetings and membership are free unless otherwise specified (besides the cost of your lunch). May 11th, 12 – 1:30pm at Earthfare on Pelham Road – Balancing Hormones, YOUR Way! Pam Bramlett, RPh, from Compounding Solutions, will talk to our group about hormone imbalances and how to treat them. Pam spoke at Raspberry Moon’s November Lunch and Learn. She’s a great speaker so I’m looking forward to hearing her again. RSVP on Facebook. May 23rd, 11am – 2pm – Wildcat Wayside Wildflower Walk. My friend Jaidra will be leading us on a walk in the woods at Wildcat Falls. This beautiful hike will take us through a cove forest in the Mountain Bridge Wilderness area to visit a beautiful water slide and spray cliff community. On the walk you can expect to see a wide variety of plants and animals that are indigenous to the Southern Appalachian Mountains, an area known as a “hotspot of biodiversity”. After the hike we will have a late lunch at Tandem Creperie and Coffeeshop in Traveler’s Rest. The cost is $5 plus your lunch. RSVP and get carpool details on Facebook.